The Slim Par 56 is our most popular option, and this is the same light just the case is white instead of black. 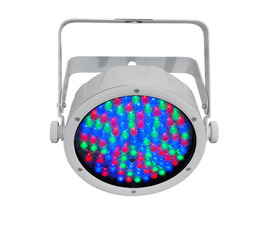 They are RGB LED lights, and feature a built-in digital display to select a static color or pattern. Choose from these 7 built-in colors: Red, Green, Blue, Cyan (light blue), Magenta (this color can sometimes appear purple and sometimes more pink depending on the ambient light in your room), Yellow, White. Wondering how many Slim Par 56 [white case] to rent? Just enter either the square footage, or dimensions of the area you want to light in the form below to get an instant recommendation.